TMNT Entity: The Gamera-thon concludes! 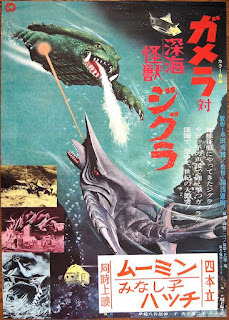 My trip through the Showa era Gamera series concludes. It took a little longer than it was supposed to (I'd intended to finish up by Halloween), but I got through 'em all. All-in-all, I'd say my favorites were "Return of the Giant Monsters", "Attack of the Monsters" and "Gamera vs. Monster X". They're all weird and goofy and fun, but without long boring stretches like some of the other films in the series. Now I'll get back to reviewing the 1987 TMNT cartoon produced by Fred Wolf. The "proper" seventh season is actually full of a lot of good episodes and I'm looking forward to rewatching them. Super Monster was practically a lost film before the Shout Factory release. I'm surprised no one brings that up. Will you be reviewing the rest of the Nick show? And possibly the 4kids series?